As a city, Łódź is an anomaly in many ways. Architecturally, economically, culturally, socially and most certainly artistically. 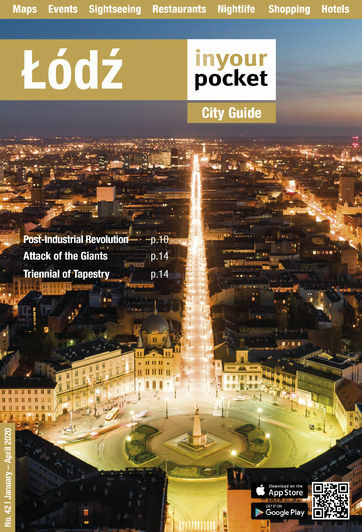 While it sits nicely alongside other European post-industrial revitalization success stories such as Manchester and Rotterdam, Łódź however, remains decidedly rough around the edges and slightly out of focus. There is a palpable undercurrent of frenetic creativity that seems to lurk around every corner and is hiding in every abandoned courtyard. When you peel back the compounded layers of modernity, industry and decay you find a city of artists that is steeped in the arts, with the cinematic arts being its clear pedigree. Cameras of all shapes and sizes have been the window to the soul of this city since the shutter box's first inception. As the Industrial age slowly faded there were cameras there to capture its glorious demise. WWII was a moving tapestry of tragedy and terror and countless images haunt the cities museums to this day. With post war reconstruction came a pronounced change in film formats and the silver screen took centre stage. The now world famous National School of Film opened its doors in 1958 and Łódź has had a love affair with celluloid ever since. But what are moving pictures but rolls of stationary frames taken with a bigger camera and most cinematographers consider themselves photographers all the same. So after a half century of dominance of Film and the Film Industry in Łódź, a group of passionate photographers, journalists, students and teachers set out to reclaim the city in the name of Photography. They organised the first edition of their Fotofestiwal in 2001, which, at the time, was the first independent photography festival of its kind in Poland. From the very first edition the organisers were committed to presenting an ambitious program that didn’t just show trendy photos, but rather presented works and workshops that were more sociologically oriented and politically challenging. They consciously present the images of world renowned photographers (e.g. Nadav Kander, Aleksiej Titarenko and Larry Fink) side by side with home-grown heroes (Jerzy Lewczyński, Zofia Rydet, Józef Robakowski and Łódź Kaliska) and up-and-comers alike. The Festival has grown exponentially with each passing year and the organisers have refined their scope while expanding their vision. Since 2006 each festival has had an overarching theme that has both functioned as a focal point and a mission statement. In 2008 they launched the Grand Prix Programme photo competition which established a competition for young photographers and has grown in stature and importance over the years. The mission of the Festival now extends to education as they have put an increasing emphasis on blurring the boundaries between passive viewers and active participants. This philosophy extends to the venues that they choose for the festival as well. Łódź acts as the canvas and the dark room where photos not only hang in space but they develop a new relationship with the weathered walls around them. The old brick factories, forgotten courtyards and towering chimneys help make the festival a post industrial photo manifestation.